2. How would you style this seasons' pastel trend? I am in love with the colour 'mint' at the moment. I recently purchased a mint blazer from H&M and I love wearing it with pastel pink lipstick! 3. Name your top 3 hair products. They would be Palmolive Naturals Intensive Moist Pink Shampoo (I've been using this for almost a decade! ), Tresemme Curl Care Bouncy Curls Defining Gel and Batiste Dry Shampoo. 4. Any allergies? I used to be allergic to shellfish, but I think I might have already outgrown it. I'm allergic to some lip products that make my lips flake, and I've tried an eyeshadow before that made my eyelid swell for days! I don't know what the exact causative ingredients are though, I'm not too bothered to get checked. 7. (Cliche question, but interesting:) If you were an animal what would you be, and why? I think if I were an animal, I would be a cat. People think I'm quite graceful when I move, I suppose it has something to do with my ballet background. I also like being groomed and pampered, and just being lazy. 8. High-Street or Designer? High street. I can't afford Designer yet, and I think they are soo overpriced! I'd feel less guilty if I ruined something I bought from the High Street than Designer. 10. What are you most afraid of? I'm afraid of not graduating, after 6 years of Medicine and so many years of studying before that. And I'm also afraid of anything bad happening to my parents - God forbid. 11. What is your favourite season, and why? I love Spring! It's when flowers start to bloom and the weather warms up a bit, but not too hot. Daylight gets longer and the pretty girly pastel trend starts! 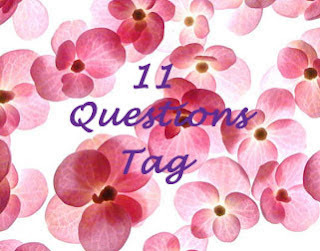 And here are my 11 Questions for YOU! 2. What are the top 3 Beauty Products you cannot live without? 4. What's your favourite form of exercise? YAY a tag! : D Will do it tonight instead of homework >: D mwahahaha.. don't tell my teacher! Haha, be sure to hand in your coursework on time though! Hey Love, thanks for tagging me!! I'll do a post on this and let you know when it goes up. :) Love learning cute little things about you! And about the pink trousers.... pink trousers are SO up your alley! You're such a sweetheart you'd look so adorable in them!